Yesterday’s wide spread up bar on the usd to cad daily candle chart merely served to emphasise that the bullish engulfing candle of Tuesday was more than a simple short squeeze and therefore a move we need to consider with some degree of caution particularly for for those of you with open short positions. The high of the day closed well above both the 9 and 14 day moving averages in a move very similar to that of earlier in the month. Indeed the pattern now forming could be considered a double bottom, and therefore a reversal we need to analyse carefully, with the key issues being the 40 day moving average and the 1.11 price handle. The first of these is now on the horizon and naturally and break and hold above this key technical indicator would suggest that the reversal has some momentum. 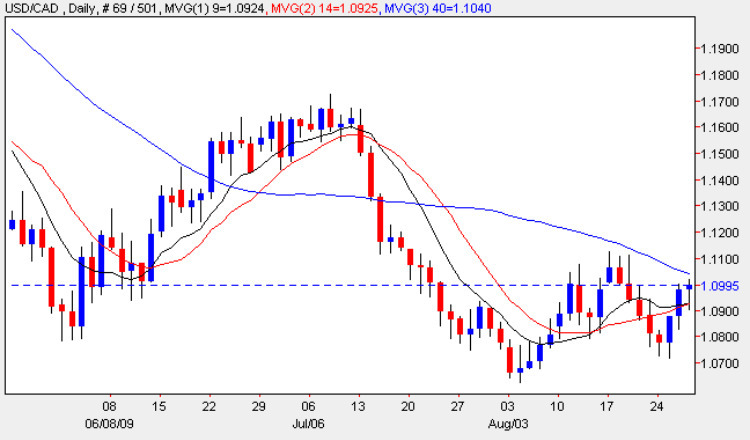 Secondly a breach of the 1.100 price level would again suggest that the move is likely to be sustained and is not simply the market taking a breather after the recent long decline, and with market volumes likely to return to normal following US Labour Day next month, this could be a signal that we are about to see a change in sentiment for the beleaguered US dollar and therefore a reversal in the recent downwards trend. With no Canadian news, the main fundamental news on the economic calendar today for the usd to cad was all about the US economy and in particular the Preliminary GDP figures which came in better than expected providing a boost to the US dollar, and a strong move higher for the USD to CAD following a fall earlier in the trading session. The unemployment figures were less welcome coming in worse than expected at 570,000 against a forecast of 562,000, but on balance the recession seems to be coming to the end of the current cycle and we may now be seeing the start of the long slow recovery process long awaited by the markets in general.